Fabric-covered Flower Pot - Home. Made. Interest. 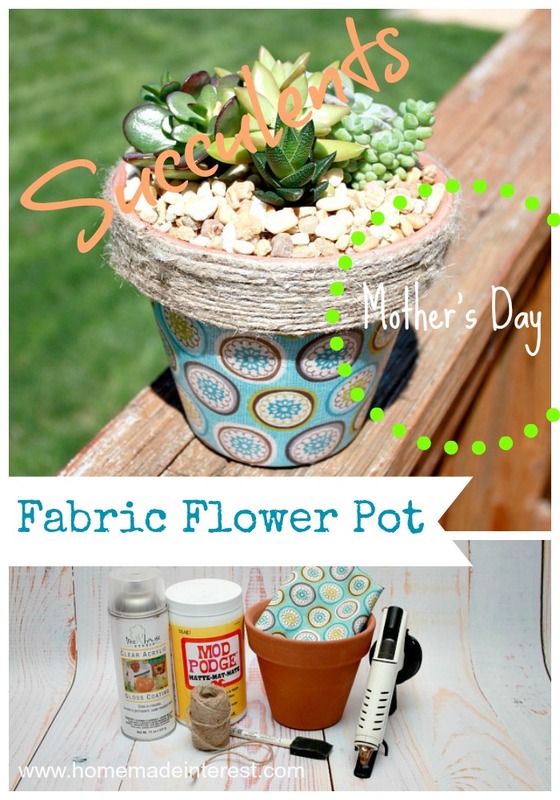 This colorful Fabric Flower Pot is an easy Spring craft that makes a great Mother’s Day gift! We’ve seen the fabric-covered flower pots on Pinterest several times and we always love how they look so we decided to give it a try ourselves. I thought it was a fun project and using fabric gives you so many color and pattern options. The first step is to mark your starting position on the pot. This will make it easier to tell when you have rolled the pot in one full circle. 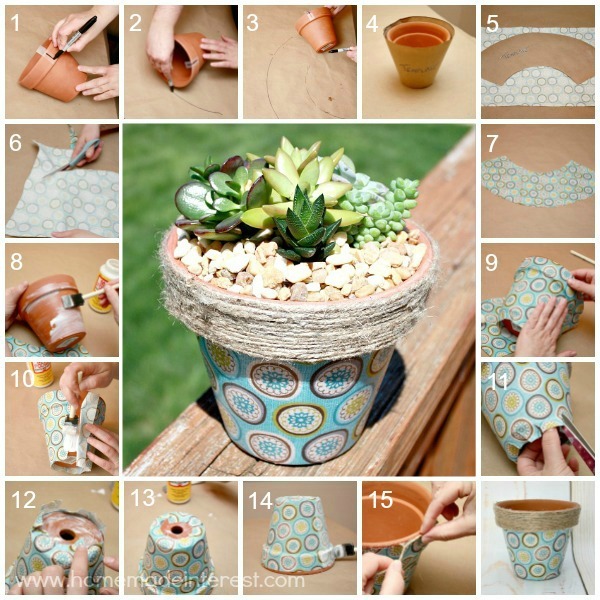 Place a piece of tape on the flower pot and make a mark with your marker. Lay the flower pot on the paper you are using for your template. The pot should be positioned so the starting point mark is facing directly down. While holding a marker against the top rim of the pot roll the pot to the side moving your marker with it across the paper to create a line. When your starting point mark is once again facing directly down you have made one full rotation. Repeat this step holding your marker against the bottom of the pot. When you are done you can take the piece of tape with the starting point off of the pot. Lay the template on your fabric and lightly trace it. We made our outline slightly taller than the template so we would have excess fabric to curl under the bottom. If you are covering the entire pot you want to have enough to wrap over the top edge of the pot too. Once you have your outline on the fabric go ahead and cut it out. Now is the fun part…Mod Podge! Using a sponge or paintbrush cover the pot with a thin layer of Mod Podge. Place the edge of your fabric on your pot (with a little excess above, if you are wrapping the top, and below). Start smoothing the fabric around the pot making sure to get any wrinkles and air bubbles out. The fabric forms to the rounded shape of the pot easily so the process is pretty simple. Once you have the pot covered take the excess at the bottom (and top if you did it) and make small cuts all the way around. This allows you to fold the edges down without creating creases. Now that the pot is completely covered take the Mod Podge and coat all of the fabric. Then let everything dry. If you are doing the twine around the top you can flip the pot back over when it is dry and begin wrapping the top edge. Just put a dot of hot glue, press your twine into it and then draw a thin line of hot glue around the top edge, pressing the twine down as you go. Just keep gluing and wrapping until you get to the bottom of the pot rim. Once your pot is dry, tape off the twine so it won’t get sprayed and use the acrylic sealer to coat both the inside and the outside of the pot. This will help waterproof the pot and keep the moisture from the wet soil from leaching out from the inside of the pot which could create bubbles in your fabric. Put a plant in the pot and you are done! Don’t forget! 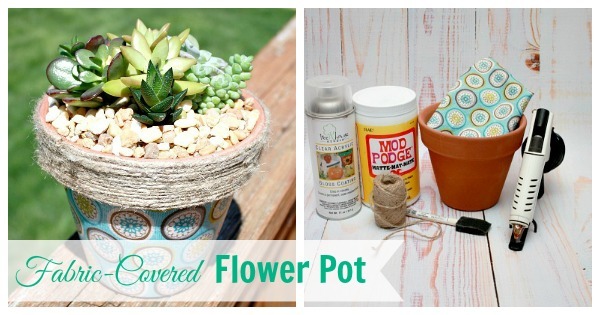 Mother’s Day is just around the corner and this cute little flower pot project is perfect. Instead of giving mom flowers that will die in a few days and a vase she’ll never use again you can give her a plant she can put in her windowsill or on her patio and enjoy all summer 🙂 . Your pot is so gorgeous. I love that print…. What a fun gift idea for mothers day!! Congratulations! You’ve been featured on Wicked Awesome Wednesday! Who would have thought to cover a flowerpot with fabric! Beautiful! Stop by the website to pick up your “I’ve Been Featured!” button! Thank you so much! Cant wait to see what is shared at this week’s party! I did it! I follow the steps but it looked little dirty because the pod I guess .